After trading for 55 years, Lawson’s Record Centre is closing. At 380 Pitt Street is the last remaining of what was once a row of secondhand record stores on this block between Liverpool and Goulburn streets. When I started shopping there the top three on this stretch were Ashwoods, The Pitt, and Lawson’s. At that time there was a vast vacant lot across from the record stores, the whole block between Pitt and George Street empty. The Anthony Horderns department store had stood here until it was demolished in the 1980s. But I paid the vacant lot little attention. The city had many such holes at the time, on pause between demolition and development. Instead my energies were focussed on the record stores, and what I might find within. I found records inside them, of course, but as much as I enjoyed looking through the racks, I enjoyed being in the stores themselves. They were cluttered, serious places, dense with records and books, with layers of gig posters decorating their walls. Their mood was one of studious attention to the pursuit of treasure, and I joined the searchers with enthusiasm. When I was a teenager books and music were my lifeline. I navigated the city with subcultural intent, frequenting the record book stores, navigating by the cinemas and arcades. Approaching Lawsons this feeling returns to me, although the rest of the street has changed and is now mostly restaurants. Through the door I can see the long rows of boxes inside, through to the back wall lined with 7″ records. As I turn to go in I note the handwritten sign in the window thanking customers for their support and announcing that the last day is April 27th. Once through the narrow entranceway lined by vinyl records, I see this date is also marked on the calendar affixed to the pinboard behind the counter. There’s a circle around the last Saturday in April and the words “last day of Lawson’s” written below it. Knowing that this may well be their last visit, the store is busy with people searching through the records and CDs, heads down, flipping through. As I browse ’50s 60s R&B’ a man beside me explains to his son the system of alphabeticising artists under their first names, one of the store’s quirks. I turn my attention to the walls and their layers of posters. My favourite, which has been on the wall since the first time I came to the store in the 1990s, is the State Rail fare evasion poster that shows a figure being consumed by a Tyrannosaurus Rex. “There are harsh penalties for those without a ticket”, ran a line of text at the bottom of the poster. No matter how often the LPs displayed on the rack below it changed, the day-glo scene of prehistoric fare evasion was a constant. Lawson’s too has been a constant, a reminder of an era of the city that now has fewer and fewer traces. Climbing rents have now priced it out of the city, a familiar story for other secondhand book and record dealers such as Goulds, which had to downsize from its iconic Newtown store last year, also due to increases in rent. Another stalwart of the city book and record store circuit, Comic Kingdom, closed in recent years, and the copies of Captain America and Spiderman grow ever-dustier in its unchanging front window. For many years Lawson’s has been the last store left of its kind in the city, but now its time is coming to a close. A For Lease sign is displayed in the front window beside David Bowie and Prince. But inside, for these final weeks, it has the same atmosphere of studious searching, looking through, hoping for treasure. For a guide to Sydney’s record stores see Diggin’ Sydney map of record stores. In the floral calendar of Sydney, after the pink of the crepe myrtles in late summer comes the velvet purple of the tibouchinas. Like the city’s most renowned non-native flowering tree, the jacaranda, the tibouchina also originated in Central and South America. Yet the tibouchina is still an unfamiliar name to many, even if their iridescent purple blooms are a recognisable marker of the change of season. For most of the year the dark green leaves and slim branches of tibouchina trees seem unexceptional, camouflaged by other garden plantings. But in March and April, when in bloom, they flare into a mass of intense colour. Like jacarandas, they transform streets into constellations of purple. This purple is richer, darker, as befits the time of year when the days grow shorter, and there’s a briskness to the air, a colder wind. Pale mauve jacarandas flowers are light, airy spring; deep purple tibouchina flowers are the dark of the lengthening autumn nights. A tibouchina – or as they are were then known, the Lasiandra – formed part of a Horticultural Society Exhibition in 1869; by 1887 they were being grown and sold in nurseries. By the 1920s the tibouchina was a familiar tree in suburban gardens along Australia’s east coast, and the beauty of their flowers was celebrated: “The head-piece of most of the shrubs is just covered with loveliness”, extols one 1928 article, “lasiandra is a gem thing”. Today tibouchinas can be seen across city parks and gardens, usually in isolation, but in some areas such as in Ashfield and Summer Hill, they have been used as street trees, forming an autumn corridor of bright colour. It is a surprise to turn a corner and encounter such a street, as if colours have inverted, the greens changed to purple, as if they have pulled the last of the summer’s heat from the air, in order to glow so richly. Maybe it has been a little while since I’ve travelled up this stretch of Parramatta Road, or maybe it happened suddenly, but now there’s a great gap between Pyrmont Bridge Road and Mallett Street, where a whole block of buildings have been demolished. The light is the first thing I notice, how the demolition has opened the streetscape to the sky. I try to remember what had been there. A golf store, that’s right (and before that, a building supplies store distinguished by a window display that included a mannequin on a toilet) and a 1930s bank building with a brick and sandstone facade, a gym, then a row of former warehouses that had been repurposed as furniture stores. It was a bleak stretch: the other side of the road more favoured by pedestrians, with its slightly more appealing businesses – a toy store, vacuum cleaner store, and school with a row of jacaranda trees along the fenceline. There’s no signage – apart from advertising – on the hoardings that seal off the block, but soon perhaps it will come, extolling the benefits of the Westconnex M4-M5 link tunnel, for which this land has been cleared. This will be a tunnelling site, from where the drilling machinery bore in to create the tunnel that will undercut Parramatta Road Creek on a path between Haberfield and St Peters. On the Westconnex website, a progress bar announces the works for the overall scheme to be now 47% complete. When I click on the “connecting communities” icon, a message comes up: “You are not authorized to access this page”. The benefits to communities may be concealed but other information is more easily accessed. I find out that the start of this year local residents had the opportunity to vote on the preferred colour of the hundred-metre-long construction shed that is to be built here to mask the drilling operations: mangrove, ironstone, or shale grey? For now, the site is still being cleared, the remains of the buildings and their utility lines still in the process of being removed. The shed of mangrove/ironstone/shale grey corrugated iron is yet to be constructed. As I look across this newly opened stretch of land, I notice there are a few remaining buildings, a small cluster at the narrow end of the block. The wall at the edge of them has a sliced-cake look, and reveals a vertical strip of ghost signs: CASHDOWN, then below, Brown and Dobinson, with the note they have “removed to 145 Australia Street Camperdown”, and below it the tail end of a logo, interrupted by a doorway: “-oid”. Whatever it is, it is “Perfect”, the one full word to remain on this section of the wall. I stand by the gate, looking up at the sign, trying to decode it, as the works go on inside: digging and churning, clods of earth and splinters of building rubble being chewed by yellow excavators. It would be useful if they could remove a few more bricks from the wall to resolve anothe letter of “oid”, but I don’t try my luck with the asking the man at the gate, who has already shifted the blue mesh that covers the wire so I can take a photo through the fence. Later I get to sleuthing, find out that Cashdown was the C. Ashdown Carriage Company, that in 1913 it manufactured items such as Buggies, Phaetons, Buckboards, Sulkies, with or without Rubber Tyres, to suit pony or horse. I feel as if I, too, am “under the paint” as I work to solve the puzzle, inside a network of details. On the way home I go past the building on Australia Street to where the motor garage Brown and Dobinson removed in the 1930s, though it reveals to me no further information. I take the fragments of the words “oid” and “ouer” and they rattle around in my head like an unsatisfying Scrabble hand. But then, like Cashdown became C. Ashdown, I realise “ouer” is probably “quer”, and I guess that “quer” is probably “lacquer”, which means “oid” is possibly an automotive paint. A chain of associations stretches out, across time, and the city and its transport technologies. C. Ashdown closed in 1919, as the automotive era was about to begin, giving way to the motor garages, petrol station and car dealerships that are still a large part of Parramatta Road’s landscape, as much as it is reshaped, on and under the surface. A hundred years on cars dominate this landscape, and will continue to do so into the future, as the land is carved up to accommodate them. A sign such as this one is a chance to slice a few layers back through the recent past, to consider how much, and how little, has changed. These rainy grey October days have seen me looking through my papers, trying to arrange them in some sort of system. I’m a haphazard archivist. The activity of sorting rarely leads to anything but me surrounded by books and papers, sensing how each one resonates with its own story, so it’s impossible to discard any, and easy to become sidetracked rather than instilling order. Today I’ve spent the day sorting the Sydney Scraps category, which is an unruly mixture of pamphlets, guidebooks, photos, postcards, and miscellaneous ephemera. They resemble the bundles of papers one returns with after an international holiday, the importance of each scrap heightened by its dislocation from everyday life. In this case, it’s a time-traveller’s dossier, each scrap accrued from a visit to a Sydney of the past. First let’s visit Sydney of the late-1950s, via a pamphlet produced by the prolific New South Wales Government Tourist Bureau. Such pamphlets were intended to be functional documents that informed the visitor to the city of the potential activities and experiences to be had during their visit. They usually made an attempt to describe the city’s character and atmosphere, as well as create a sense of excitement and anticipation. This combination can lead the time traveller into some unexpected terrain. 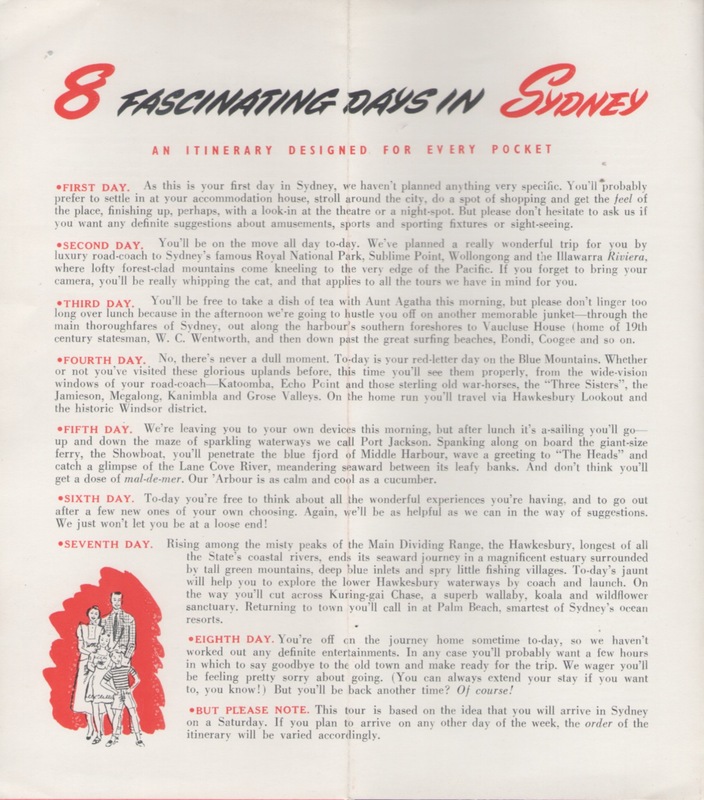 By far my favourite part of this pamphlet is its itinerary for ‘8 Fascinating Days in Sydney’. It is not the suggested activities, so much as the breathless way in which they are described that makes me wonder: was the 1950s really a time when people expressed their frustration at leaving the camera at home by “whipping the cat”, when they had ventured out on a “memorable junket”? As for “penetrating the blue fjord of Middle Harbour”, and “lofty forest clad mountains come kneeling to the very edge of the Pacific”… I have spent a good while trying to imagine who might have written the copy for this brochure and believe them to have been an avid reader of romance novels. In 1970 the New South Wales Government Tourist Bureau has a more down-to-earth copywriter, although the brochure cover image is the opposite, revelling in the view from Australia Square as diners enjoy the “smorgasboard brunch” in the foreground. As well as a lovingly-rendered illustration of the Kings Cross Village Centre, there is a chart of costs which has the time traveller excited at the 18c middies that await. The New South Wales Government Tourist Bureau also produced weekly guides in the late 60s/early 70s, with listings of shops, restaurants and entertainments. In the introduction to the 15th-21st June 1967 issue, Lord Mayor John Armstrong praised the city’s unique features, including its “adequate facilities for sporting activities”. No risk of hyperbole there. My main attraction to guides of this nature is that they enable me to go shopping in the past. The forlorn-looking tiger, please. The guide also includes what is now a ghost tour of Sydney’s arcades: only the Strand remains. Visitors would have read these pamphlets and those like them, have laid back in their hotel beds reading over the listings of coffee spots and theatre restaurants, have crushed them into handbags and into suitcases as they packed to go home again, some keeping them as souvenirs of their time in the city. I often wonder by what sequence of events they have made it into my possession. There are rarely any clues to know what the travellers who kept these brochures thought of the city, but in one case, I know. This 1920s guide to Sydney used a sketch of the then not-yet-completed Harbour Bridge for the cover. It’s an interesting little book, given to me by my friend DL, and has delicate, tissue-paper fold-out maps that show the city streets, ferry routes and suburban shires. It really warrants a post of its own, but for now, it answers the question of what at least one Sydney visitor thought of the city. On the first page, in pencil, the name F.M. Smith is written, with the date, 22/2/33. The Harbour Bridge was complete by then, but perhaps that wasn’t quite enough to win over some visitors. The only other annotation in the book is on the page set aside for the ‘Visitor’s Diary’. What was F.M. Smith’s impression of Sydney?